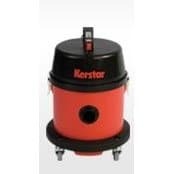 The motor heads of the Kerstar dry vacuum cleaner are electrostatically powder coated pressed steel and the canisters are non-magnetic corrosion resistant stainless steel or electrostatically powder coated pressed steel. They are all fitted with our powerful yet reliable twin fan motor to give years of faithful service. Excellent manoeuvrability and stability is ensured by their four widely spread heavy duty castors.